By midpoint in “Serenity” you may “get”the mystery behind the bizarre events if you compare this movie to writer-director Steven Knight’s “Redemption.” In that 2013 film a homeless soldier hiding out from a threatened court martial navigates the London underworld adopting another man’s identity. 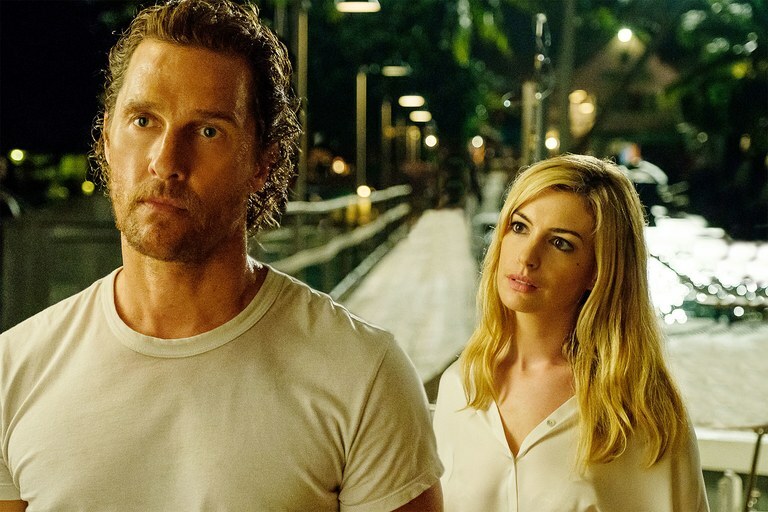 Identity is perhaps the central plot device this time, with Matthew McConaughey in the role of Baker Dill, the captain of a fishing boat on an island off the Miami coast, filmed by Jess Hall on in Mauritius. The country off the coast of East Africa may have been picked for its pure blue water, which serves as backdrop to all the activities, activities that give Baker Dill his context. There’s Rafael Sayegh in the role of young Patrick Dill, who is Baker’s son; Anne Hathaway as Karen, Baker’s ex-wife married to a violent man (Jason Clarke), Diane Lane as Baker’s love interest though she can be better identified as the woman hiring Dill’s gigolo services, and most bizarre of all, Jeremy Strong as Reid Miller, a clenched salesman that runs after Baker with a pitch to save the captain from committing a murder. The plot turns on ex-wife Karen’s offer of ten million dollars to Baker if the captain would take her husband out on his fishing boat, get him drunk and toss him overboard to the sharks. As to why she does not simply divorce the guy with whom she has non-stop arguments and is plagued by beatings that leave scratches all over her back, she explains that he “knows too many people,” meaning that he could have her killed. The offer sounds good to Baker since he is regularly hard-up for money, but his conscience, in the form of Duke (Djimon Hounsou), the assistant that he hires to help his clients land the huge fish, warns him to turn down the offer. What’s strange is how Duke got wind of the unfolding developments in the murder offer and even more puzzling is how the salesman, who appears to want only to give the captain a week’s trial of a new machine, is also aware of what’s going on, likewise warning the man not to go through with the crime. Meanwhile, back in Miami, Baker’s son Patrick spends ten hours a day on his computer, terrified of his violent stepfather, knocking out numbers and texts that will eventually lead to an explosion of emotions. The film is replete with some interesting absurdities, foremost being the way Reid Miller, running after a potential client who wants nothing to do with him, walks in his suit into the ocean as though posing for a Magritte painting. The whole idea is solid, but the screenplay is filled with hackneyed dialogue, Anne Hathaway seems modeled to imitate Veronica Lake with her long blond hair reaching almost to her right eye, and McConaughey’s being McConaughey. The handsome actor projects a perpetual suntan, perspiration sometimes pouring from his forehead , and a four-day wisp of facial hair completing the picture of a grizzled fellow swept up in murderous schemes that others in his circle appear to know about. How is this possible considering that the conferences he has with his ex are private and confidential?